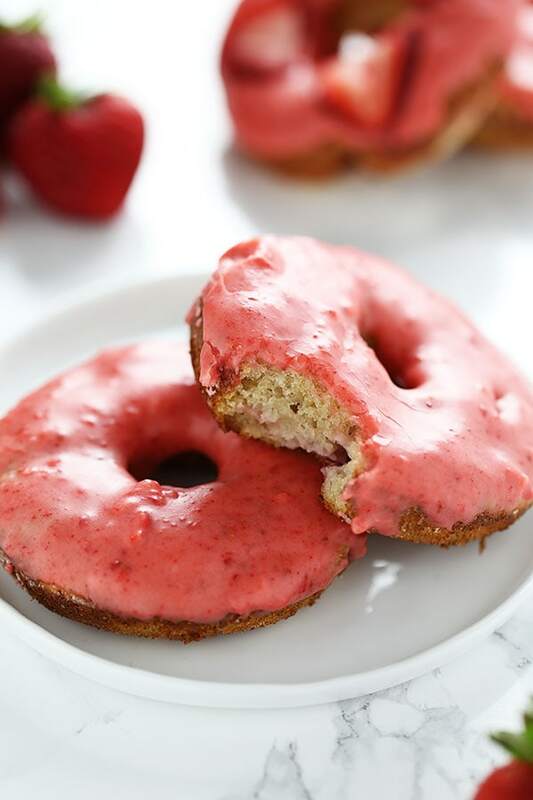 Lightened up with Greek yogurt, these fresh Strawberry Baked Donuts feature an ultra thick pink strawberry glaze and come together in just 35 minutes! No artificial flavors or colors. Taste: Ultra fresh with tons of strawberry flavor, and a hint of tangy lemon! Texture: Since these donuts are baked from a batter, they’re more like muffins in texture than like fried yeast-raised donuts. However, they’re still delightful and you can’t beat the 35 minute start-to-finish recipe time. Ease: Ridiculously easy. Use a ziptop bag to squeeze the batter neatly into the donut pan. Glazing is a little messy, and the glaze is really thick and syrupy but it’s so worth the mess. Pros: Beautiful, bright, and light baked donuts. Would I make this again? Absolutely. Next time I might try with blueberries. I set the oven timer to 1 hour instead of 10 minutes. Our oven has a digital keypad that allows you to enter the time and apparently I entered one to many zeros. I honestly don’t even know how I managed to do that. We’ve been in this house for over a year, so I can’t even blame it on adjusting to a new oven. Luckily I realized my mistake about 17 minutes into baking. Those poor donuts were like little burnt hockey pucks. And I actually like my baked donuts ever so slightly crispy at the edges… but these ones were totally inedible. Thankfully I had enough ingredients to try the recipe again, this time setting two timers just in case! Do you ever do stuff like that? Really stupid mistakes that just totally blow your mind… like how did I even manage to screw up something so simple?! Anyways, I’m excited I managed to finish this recipe because these donuts are so fun and fresh and perfect for warmer weather. What I love is that all the strawberry flavor and even the bright pink color of the glaze is totally natural. No artificial flavors or food coloring! 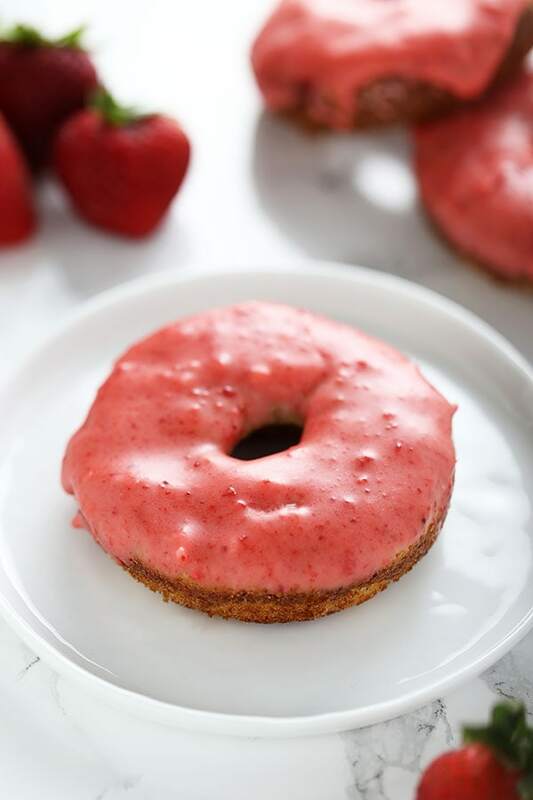 The glaze is made with freeze-dried strawberries, which I usually purchase at Super Target or Trader Joe’s in the aisle with other dried fruits like raisins. 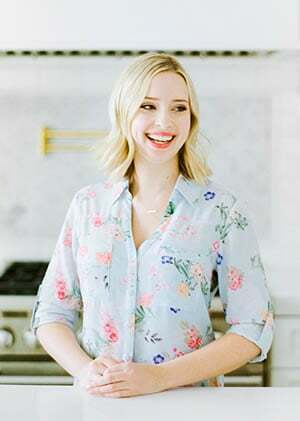 I hope you’ll try this recipe out soon and let me know what you think in the comments below! *Freeze-fried strawberries are available at most grocery stores near the other dried fruits like raisins. Preheat the oven to 400°F. Spray two 6-cup donut pans with nonstick cooking spray. In a large bowl whisk together the flour, sugar, baking powder, baking soda, and salt. In a small bowl whisk together the egg, yogurt, oil, and lemon juice. Make a well in the center of the dry ingredients and pour the wet ingredients in. Add in the chopped strawberries. Gently fold everything together until just combined. The batter will be thick, do not overmix. Scoop the batter into a piping bag or freezer bag and snip a bottom corner with scissors. Squeeze out the batter evenly into each cavity of the prepared donut pan. You may only have enough for 11 donuts. Bake for 10 minutes or until golden brown. Let cool for a few minutes and then flip over onto a cooling rack to cool completely. Mix all ingredients in a bowl with a whisk until smooth. Immerse each doughnut into the glaze. Place glazed doughnuts on a wire rack above a lined sheet pan to catch any excess glaze. Let set for 15 minutes before serving. Is there a substitute for the yogurt? Lactose problems here. They look delicious btw. A non-dairy yogurt or milk might work! I haven’t tried so I can’t say for sure. I’m a professional chef and for some reason I seem to make careless little mistakes while I’m cooking at home. It’s like I’m exhausting all my chef brain cells while I’m at work and then when I get home I have none left and mistake cumin for cinnamon or something! We’ve all been there…on another note these donuts look incredible! 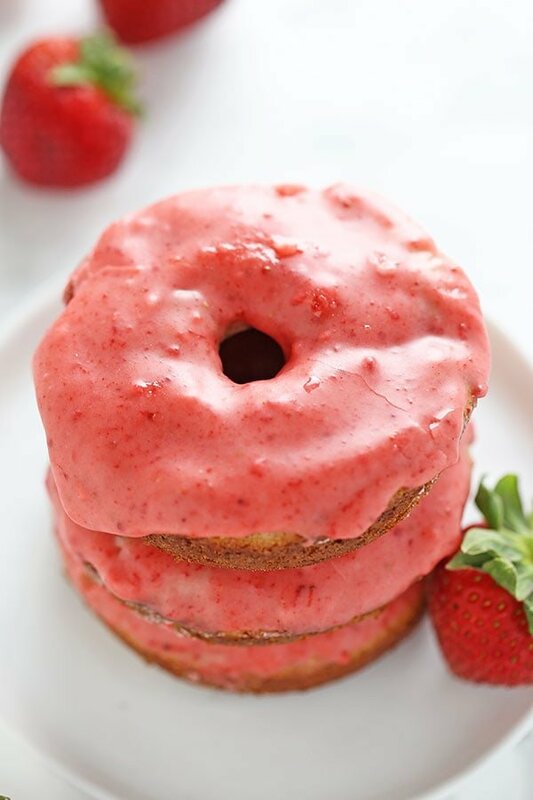 Genius to use freeze dried strawberries in the glaze! Lol I hope your butter didn’t end up melted all over the microwave! These look delectable, and I love your funny story. Yes, I”ve done these silly things; like put pans and even food in the oven, then turned on the oven to preheat, and uh oh, I smell the pan handle starting g to melt!